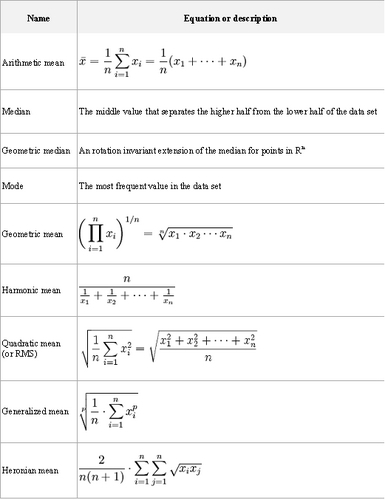 Measures of central tendency the values around which set a set of the data tends to cluster. Mean: The sum of the values divided by the number of values—often called the "average." • Add all of the values together. • Divide by the number of values to obtain the mean. • Example: The mean of 7, 12, 24, 20, 19 is (7 + 12 + 24 + 20 + 19) / 5 = 16.4. Median: The value which divides the values into two equal halves, with half of the values being lower than the median and half higher than the median. • Sort the values into ascending order. • If you have an odd number of values, the median is the middle value. • If you have an even number of values, the median is the sum of the two middle values divided by two. • Example: The median of the same five numbers (7, 12, 24, 20, and 19) is 19. Mode: The most frequently-occurring number. • Calculate the frequencies for all of the values in the data. • The mode is the value (or values) with the highest frequency. • Example: For individuals having the following ages — 18, 18, 19, 20, 20, 20, 21, and 23, the mode is 20. Outliers: points in a set of data that are significantly far from the majority of the other data. Maher and Kim: the chart you used to display the equations is awesome and the definitions are really helpful.